Learn the best wood and plywood to use, the only paint you should ever use, an almost unknown technique that makes it easy to transfer the patterns to wood, which jig saw blade you should use for plywood, and an easy priming technique. 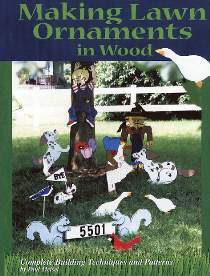 Book includes complete patterns for 38 different lawn ornaments! Patterns drawn FULL SIZE some on several pages. See how to transfer the pages to your wood without photocopying or removing the pages from the book. Learn how to arrange projects to make interesting scenes in your yard. 130 pages, over 100 photographs and illustrations. (8 pages in full color). 9" x 12" paperback.